Price per packet is $4.00, packet size is at least 50 seeds, unless otherwise specified. Ordering information is on the home page at Order. Zones included at the end of the description correspond to climatic zones used by the USDA and the RHS Index of Garden Plants. Plants in this section are California natives. Abutilon palmeri – S. California, Arizona, Mexico. 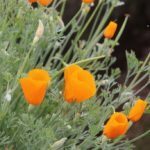 Bright apricot cup-shaped flowers are held on long wands over soft gray green leaves on this subshrub. From desert habitats, germination can be erratic. Z9? 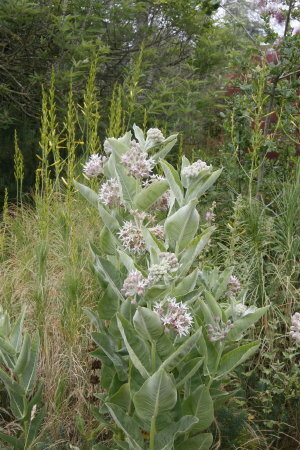 Achyrachaena mollis – California, Oregon. photo Blow Wives. The very subtle flowers of this composite open golden yellow, then turn to red as they mature. The prominent spherical 1.5″ clusters of shining silvery white bracts are held for quite a while when this annual is in seed. A grassland inhabitant. Agoseris grandiflora – Just a dandelion, but with truly grand fluffy seedheads over 2″ wide. Lemon yellow flowers over deeply lobed leaves on a basal rosette. Perennial. Should be very tough. To 12″ tall. 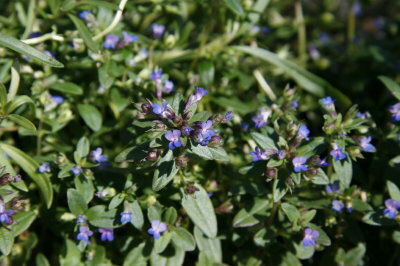 Amsinckia tessellata [var. gloriosa] – Vivid orange flowers emerge from coiled spikes on robust (to 2′) plants. Original collection from slopes in interior San Luis Obispo County and they painted the hills orange. Annual. Calycadenia multiglandulosa – photo Rosin weed is a stiff, sticky annual that can be develop a nice, long blooming mound in favorable locations. 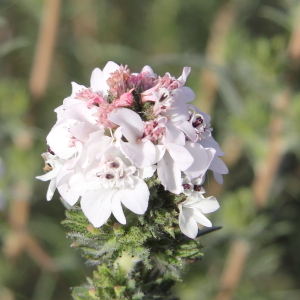 White to pinkish white flowers are dense along the stems late spring to mid-summer. 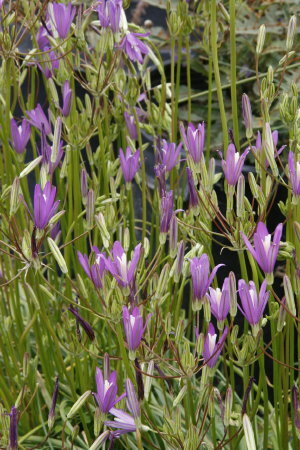 Caulanthus anceps (Guillenia lemmonii) – photo Individual flowers are lavender pink and fragrant, set along long, wand like gray stems. This annual is fairly subtle on its own, but sparkling in combination with other flowers, or in a mass. Caulanthus flavescens (Guillenia f.) – photo Erect thin spikes carry masses of bright, creamy yellow fls in spring and early summer on this slender annual. Very showy when grown in a small colony. Stems to 18-24″. Caulanthus inflatus – photo Spectacular annual with striking inflated yellow stems; terminal tip and buds are dark purple. 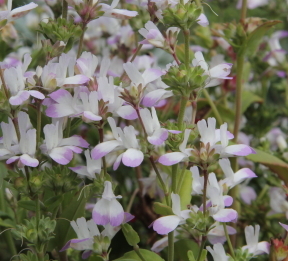 Small petals are bicolored purple and white and stigmas are pink. 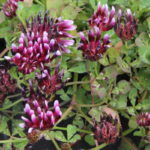 Needs excellent drainage, and grows well in containers. Can grow to 2′. 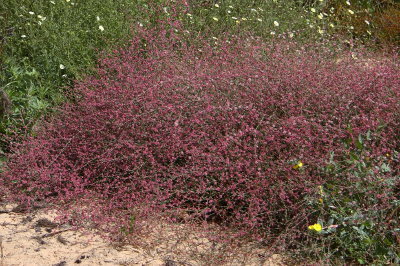 There is nothing quite like this plant, commonly known as desert candle, when it blooms. 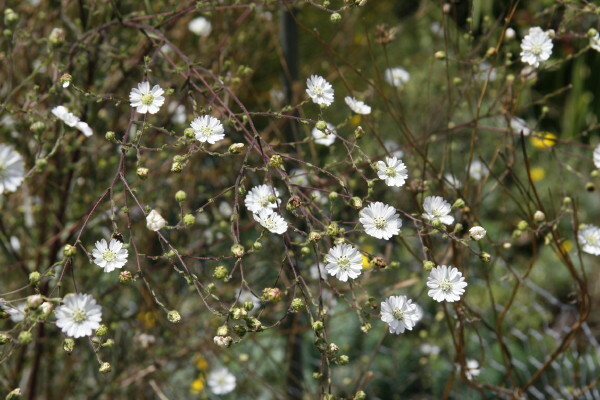 Chaenactis artemisiifolia – photo Ferny, finely dissected gray leaves are set against well branched purplish stems that can reach 5′ in a season; dense white heads of “pincushion” flowers are abundant. Annual. Chorizanthe douglasii – photo Heads of hot pink flowers on slender stems are held over low leaves in late spring on this buckwheat relative. 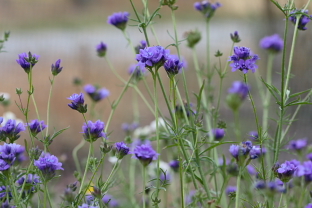 Best in lean soils, found in grassland or open woodland. Annual. 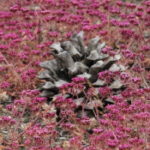 Chorizanthe membranacea – photo In natural settings, this annual is quite understated, with half-inch round heads of pinkish white flowers on erect stems. 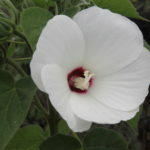 Planted closer together or in containers, it can present an impressive display of densely interlaced stems carrying white round flower heads in late spring and summer. 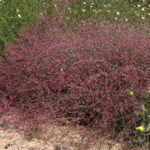 Chorizanthe staticoides– Turkish rugging. 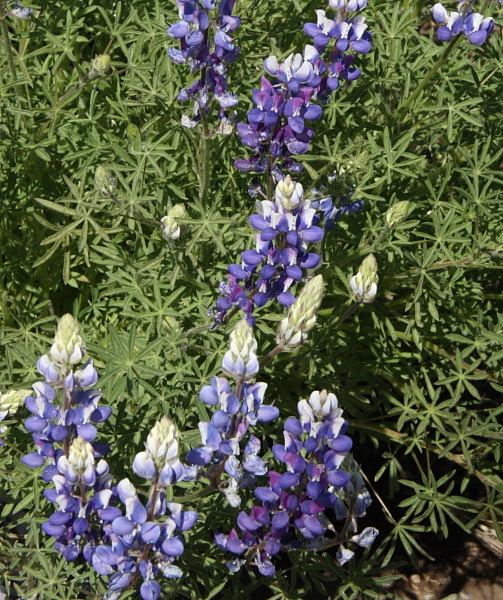 Abundant on dry slopes, this annual puts on its show in late spring or early summer. 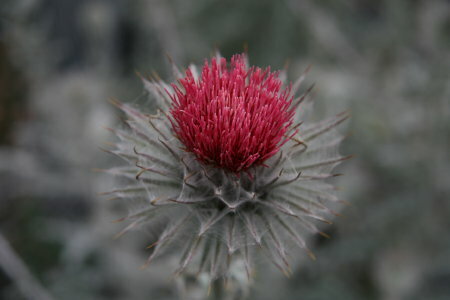 Branched stems make broad heads of bright purplish magenta, prickly flowers. Chorizanthe ventricosa – Close to flat prickly mats of vivid rose flowers spread out over bare soil in late spring. Original collection from interior ranges near Parkfield Grade. 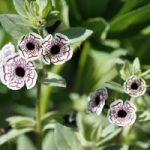 Clarkias are beautiful hardy annuals; they have been hybridized and bred for larger and more double flowers, but some of the species and varieties are the best. 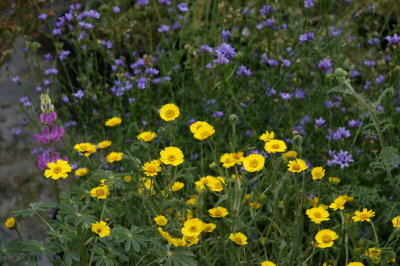 These species have been separated in the garden by space and time of bloom, so seed should be true to name. Packets contain 100+ seeds. Clarkia modesta – photo Delicate clarkia sets smallish pale pink flowers against red stems and green leaves and is covered with flowers in late spring and early summer. Prefers shady places in woodland settings. 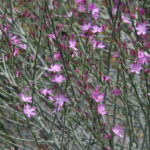 Clarkia purpurea ssp. 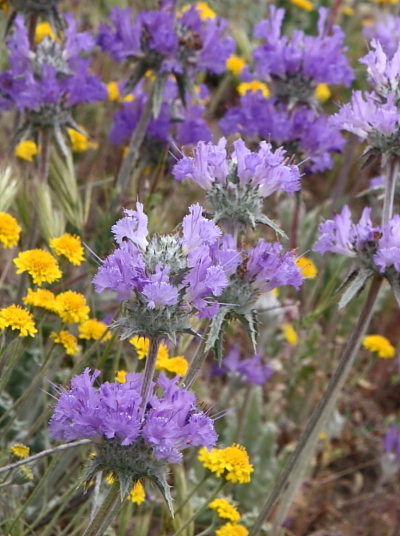 purpurea – Santa Cruz County. 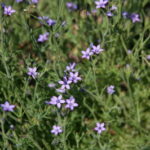 photo This form of the species is very distinctive, with very dense heads of fair sized dark lavender flowers set against blue-green leaves. Upright to 18″. 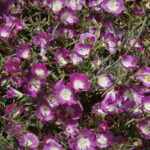 Clarkia purpurea ssp. quadrivulnera – photo The usual shiny deep reddish purple fls. have an unusual white center. Stems can reach 3-5′ in a garden setting and carry many flowers. 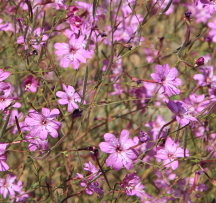 Clarkia purpurea ssp. 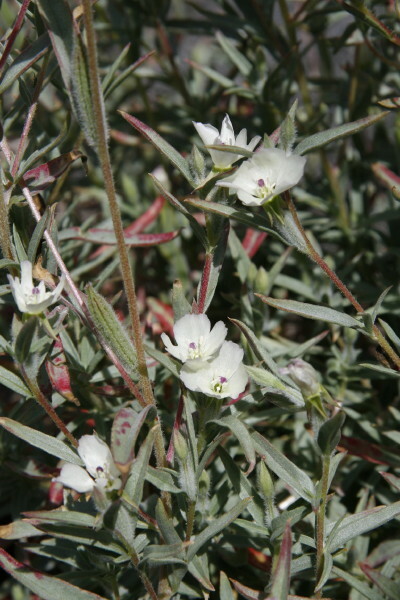 quadrivulnera -white flower- photo Erect willowy annual displays small white flowers along the stems in spring. 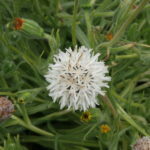 From a white flowering population in Monterey County. Grows 3-5′ in garden setting. 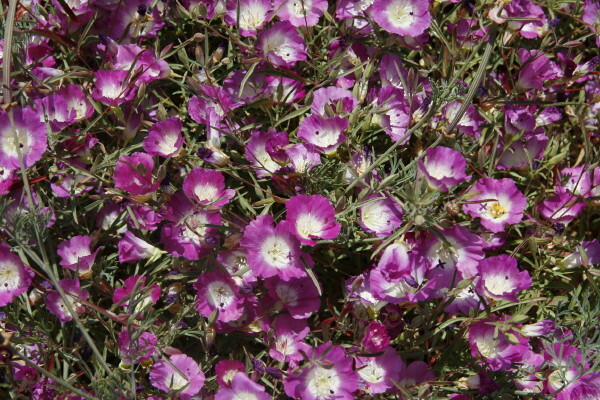 Clarkia rubicunda – photo Large lavender pink flowers have red centers on this showy annual. 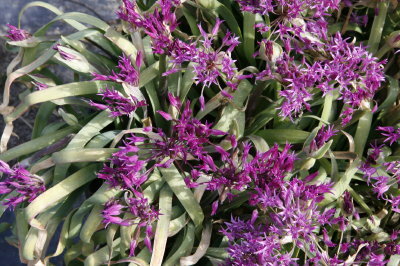 Floriferous and very striking in containers or the garden. Good cut flower. Can grow to 2’+, blooms for months. 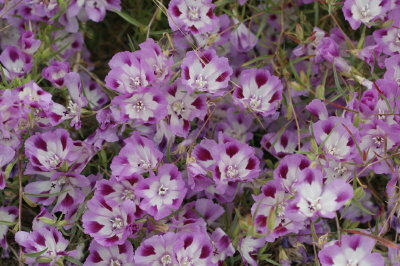 Clarkia speciosa ssp. speciosa– Shiny red purple flowers with close-to-orange centers shimmer in late spring and early summer. Best in well drained sites. 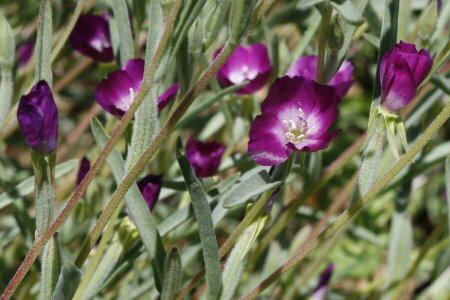 Clarkia tenella – lavender or maroon flowers – listed under Other Seeds. From South America. 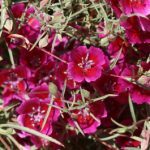 Clarkia unguiculata – compact form – photo From a colony found in Santa Cruz County, this very distinctive seed strain makes stocky columnar plants to 18″. 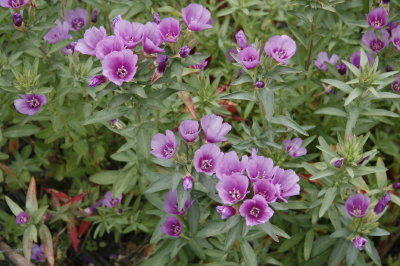 Bright mauve-red flowers and leaves are densely held. 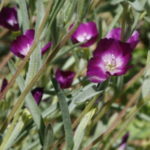 Clarkia williamsonii – photo Gaudy lavender pink flowers are good sized, with a broad white central zone, and wedge shaped patches of dark red violet on the petals. Best results with good drainage. 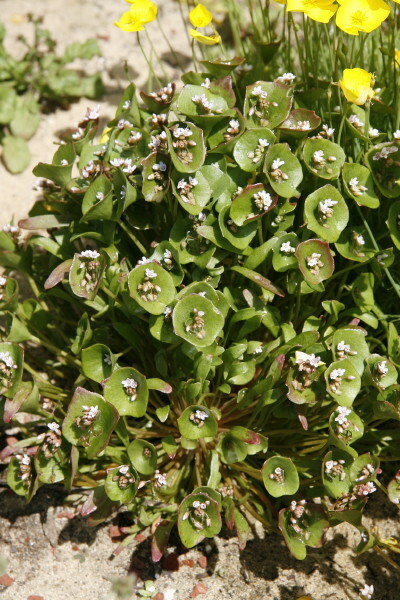 Claytonia parviflora ssp. 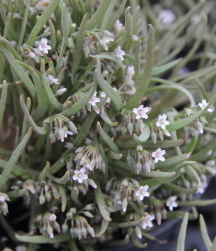 viridis –photo Diminutive annual makes tight buns of pale greenish tan narrow leaves, then produces many pinkish white flowers till the soil dries out. Great container plant. 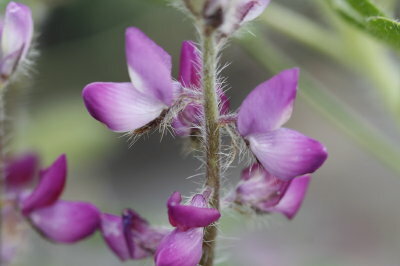 Collinsia bartsiifolia var. 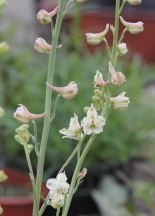 davidsonii – photo Smaller scale collinsia has many pink and white flowers on stems to 12″. Great container plant or in small scale plantings. Collinsia heterophylla-Sierra form – photo Plants from the Sierras of this species have dark purple flowers, with light central patch and red lines in the usual places. Striking annual for part shade. Collinsia parviflora – photo Roundish bright dark green leaves are densely held on short stems. 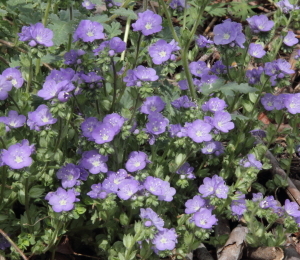 Vivid small violet blue flowers nestled in leaf axils are very well displayed. Great annual for small scale or containers. 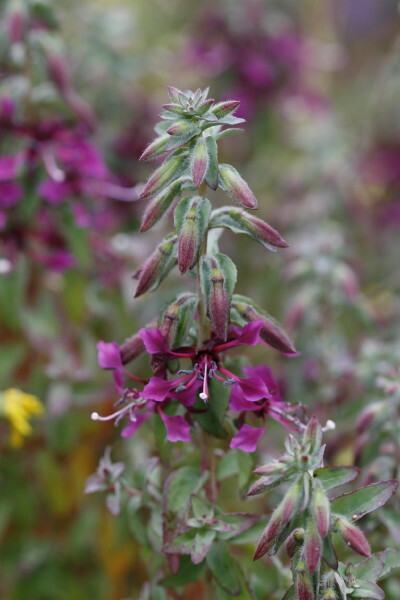 Collinsia tinctoria – photo Annual grows 2′ high. 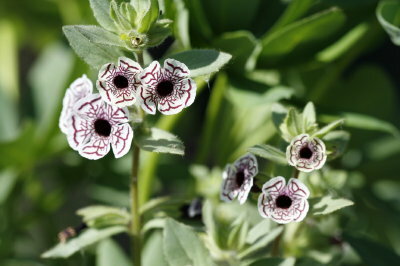 Abundant flowers in tiers are creamy white, with purple lines that seem almost painted on. Easy to grow. 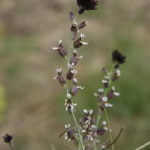 Collomia grandiflora – W. United States. photo Erect annual to 3′ with shiny green leaves and very broad dense terminal heads of beige to salmon pink starry flowers. A very unusual color in flowers. 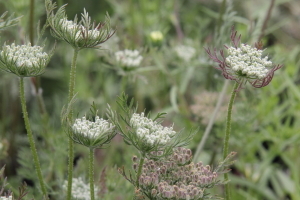 Daucus pusillus – photo Wild carrot or rattlesnake weed. 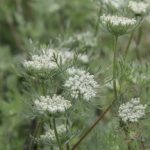 Found in many plant communities throughout California, this easy annual grows 4-20″ high with lacy leaves and umbels of greenish white flowers. Larval food for swallowtails. 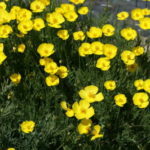 Deinandra (Hemizonia) corymbosa – photo Cheery 1″ yellow daisies appear all summer on this well branched coastal annual to 18″ with aromatic foliage and an easy constitution. 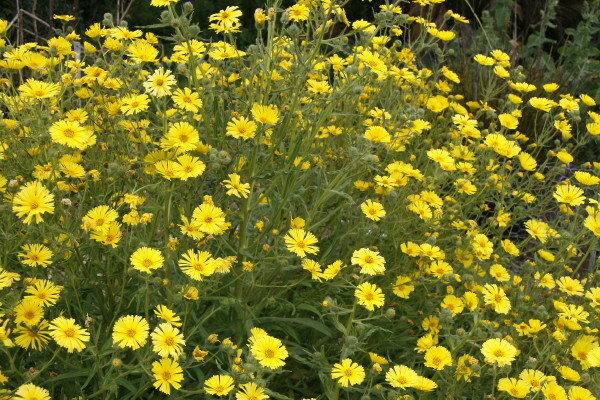 Deinandra (Hemizonia) fasciculata – photo Clouds of acid yellow daisy flowers are held in dense heads on wiry stems on this well branched, airy annual. Plants can reach 3′ in height. Extended bloom season. Delphinium parryi – Beautiful blue delphinium grows to about 18″ and blooms in spring. Can flower in its first year, then dry (like a bulb) through summer. Diplacus linearis (D. bifidus ssp. fasciculatus) – photo Shrubby monkeyflower from the Santa Lucia range has golden flowers set on woody stems. Long bloom if given some summer water. 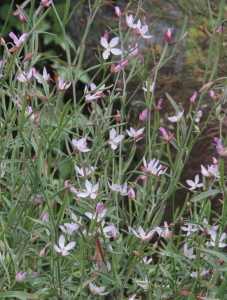 Epilobium brachycarpum photo – Autumn willowweed is sometimes called a weed, but it’s such a nice weed. 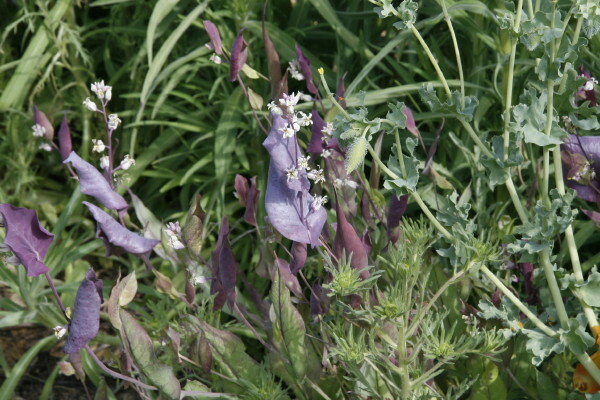 Quarter size mauve flowers are abundant in late summer with just a little supplemental water. Looks like a Clarkia when it flowers. 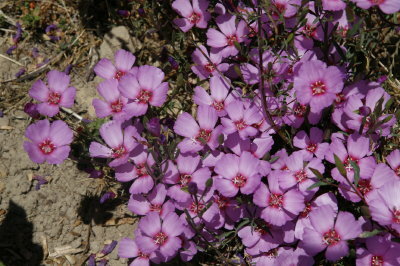 Eremalche parryi – photo Trailing stems carry many bright silky light rose purple flowers in spring on this uncommon, pretty annual. 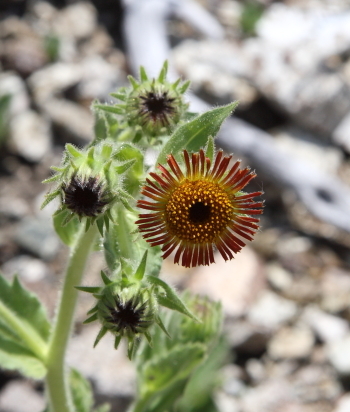 Flower form like that of many Clarkias, and quite showy in bloom. 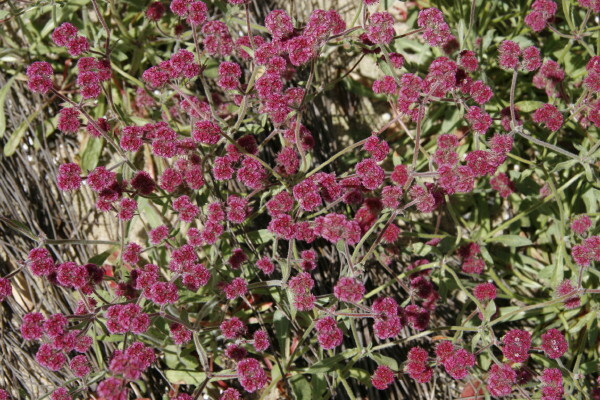 Eriogonum fasciculatum – Shrubby buckwheat covers vast hillsides in the interior part of this state. All manner of insects revel in the warm white to pale pink flowers in early summer, rusty red seedheads follow. 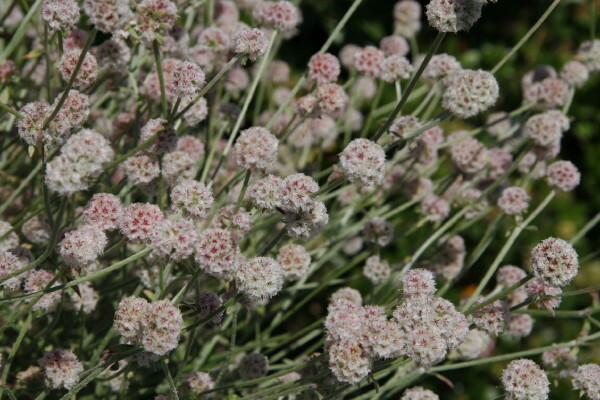 Eriogonum nudum – robust form – Local race of naked buckwheat is 5′ or more high when in bloom. Many typical white to pinkish ball flowers along the willowy stems. 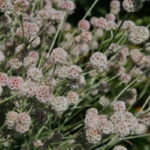 Eriogonum vimineum– California to WA, Arizona. Wicker buckwheat. photo Perfect 18″ domes with vivid rose pink round flowers held along wiry interlaced stems brighten the summer and early fall garden. Showy, annual. 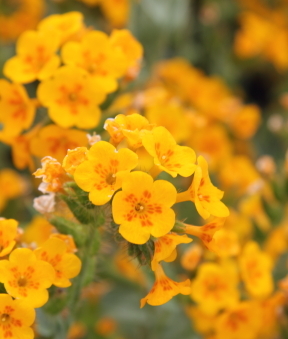 Erysimum concinnum – Fragrant creamy yellow flowers are in short spikes on this perennial wallflower from central coastal California. Tidy green leaf mounds. Eschscholzia lemmonii ssp. lemmonii – Incredibly vivid orange flowers from furred buds appear through the spring on this typically grassland inhabitant. Not as overwhelming in character (seeding around) as full size California poppy. Eschscholzia lobbii ‘Sundew’ – Creamy pale yellow poppy flowers are a little larger than the species. Easy to grow and quite floriferous. 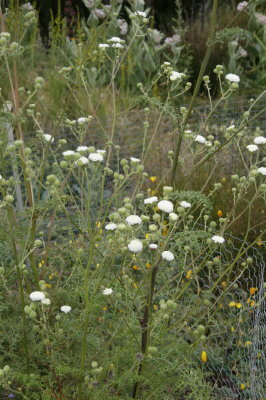 Eucrypta chrysanthemifolia – photo Divided mounding foliage has a wafting sweet-lemony smell; small white flowers are carried in loose clusters in spring, early summer. Annual, and worth it for the foliage scent alone. Gilia achilleifolia – white flower White flowered form of this cheery annual-easy and prolific in bloom. Reseeds nicely. 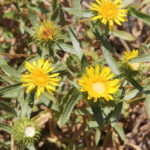 Grindelia hirsutula – Free flowering gum plant has 1.5″ yellow daisy flowers that appear for months with some supplemental watering. Rough green leaves are not gummy. Flower stems to 30″. Hemizonia congesta ssp. lutescens –photo Previously offered seed of this ssp. may have been hybrids with ssp. luzulifolia, though parent stock came from a native population. Flowers were pale yellow, foliage was delightfully fragrant. 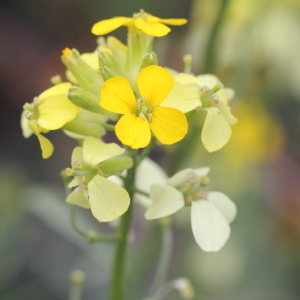 The current offering is seed from tighter growing plants with greener, less aromatic leaves, and bright yellow flowers. Annual and summer blooming of course. Hemizonia congesta ssp. 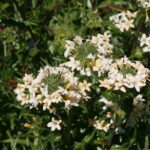 luzulifolia – photo Bright white daisies are carried on this annual tarweed and it perfumes the summer and fall air with its aromatic foliage. Blooms summer to fall. Hemizonia corymbosa, H. fasciculata now listed under Deinandra. 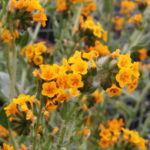 Horkelia californica – The aroma from the leaves of this unassuming, low mounding perennial perfumes the garden in the warmer months. Starry white flowers in spring and early summer can be visited by butterflies. Hulsea heterochroma – photo Very narrow rusty red rays surround a central golden disc; glandular green leaves stay low. Can grow to 3′ high.”Instant smoke” will accompany seed, as it is a fire follower. Lasthenia californica ssp. macrantha – photo It is hard to believe this perennial goldfields is closely related to the slender yellow daisy that carpets dry places in spring. Wide green leaves are form a tight cushion to 4″ high and 16″ across. 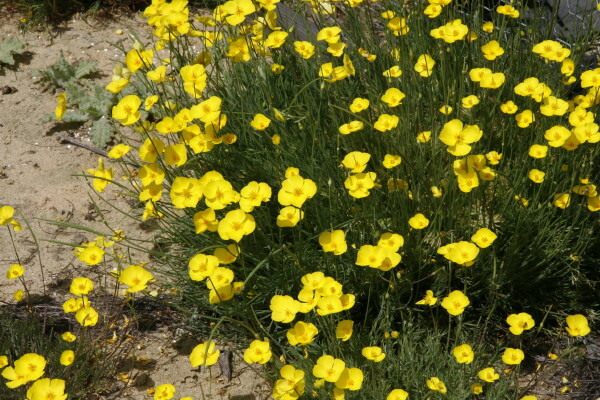 Bright yellow flowers appear almost year-round. From the immediate coast, best with some water. 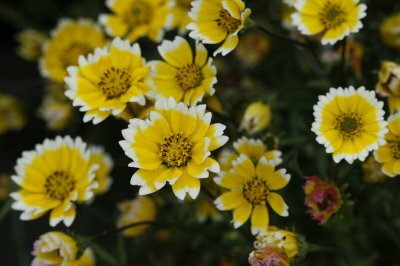 Layia chrysanthemoides – photo Smooth tidy tips. 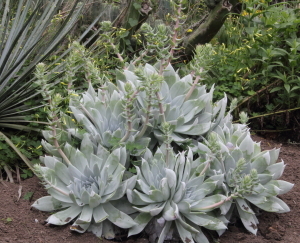 Somewhat succulent low leaves are glossy green; cheery spring flowers are good sized, abundant and yellow with white tips. Annual. 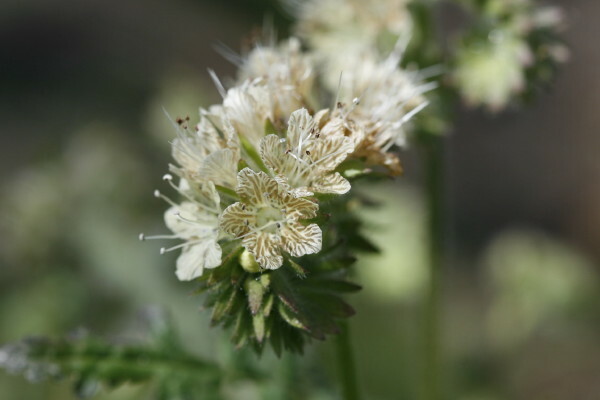 Layia chrysanthemoides—half size– This seed was received as an aberrant form of L. chrysanthemoides. 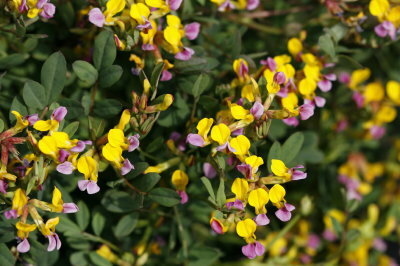 It is very similar in form and flower, but it is half the size in every way, with pure yellow abundant flowers. Annual, great in containers. 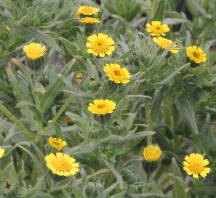 Layia gaillardioides – photo Perfumed tarweed ends the spring season with bright yellow daisies held on slender stems with that wonderful tangy aroma. Easy annual in sun or part shade. 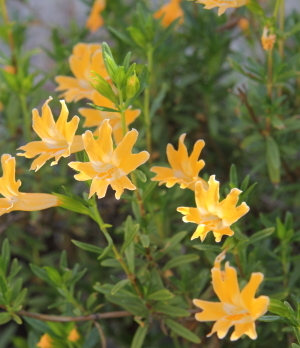 Layia glandulosa – creamy yellow fl. photo Palest yellow daisies in spring on branched slender stems create a great effect in spring. Aromatic leaves. Spring bloom is profuse, annual. Layia hieracioides — photoTall layia or hawkweek layia can reach 3′ high and bloom for months with some supplemental spring water. Yellow flowers are held on somewhat glandular stems. Layia pentachaeta ssp. 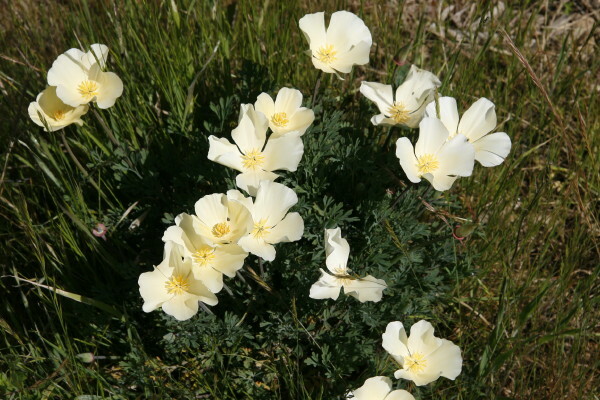 albida – White Sierra tidy tips—the common name says it all. 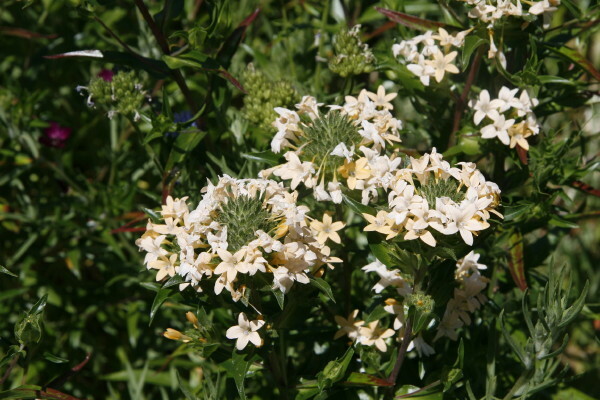 Bright white daisies on wiry stems; aromatic leaves and lots of flowers in spring. Leptosiphon ciliatus — This annual deserves a better common name than whisker brush. 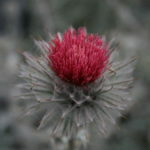 Dense fat prickly heads show off their bright pink flowers held among white feathery bracts. Spring bloom. 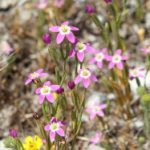 Leptosiphon “dylanae” – photo Thought to be either a subspecies of Leptosiphon grandiflorus or a distinct species, this annual extends its blooming season for months with some supplemental water. Dense heads (over an inch across) of dark lavender flowers are held on 12″ stems. Easy. 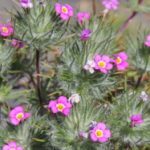 Leptosiphon parviflorus – Seed offered is from a very distinctive population championed by the late Santa Cruz naturalist Randy Morgan. Corolla limbs are golden-orange, with a pair of red dots at the base of each lobe. Corolla tubes are very long–up to almost 2 inches. 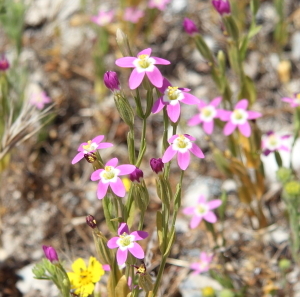 Typically, flower color in L. parviflorus is highly variable, with yellow, pink, and/or white corolla variants, often within a single population. This rare entity is fairly uniform in color throughout its very localized population. It appears to have close affinities to the equally rare coastal species Leptosiphon croceus. Thanks to Aaron Schusteff for description/botanical information. Limnanthes douglasii ssp. nivea – photo Meadow foam. 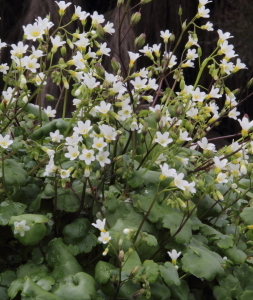 Easy annual, and it does well in winter wet soil. Pure white flowers in spring appear in abundance, before the plant disappears for the summer, to reappear with fall rains. Limnanthes douglasii ssp. rosea – Typically the low growing meadow foam puts out sheets of bright white flowers in spring. This charming variant has soft pink veining in the white flowers and they age pale pink. Well adapted to wet soils and containers. Lotus (Acmispon) grandiflorus– Rounded perennial to 2-3′ with soft light green divided leaves and pretty clusters of cream colored flowers. Persistent fruits to 3″+ across form a stiff chestnut pinwheel. Hardy to at least Z9. 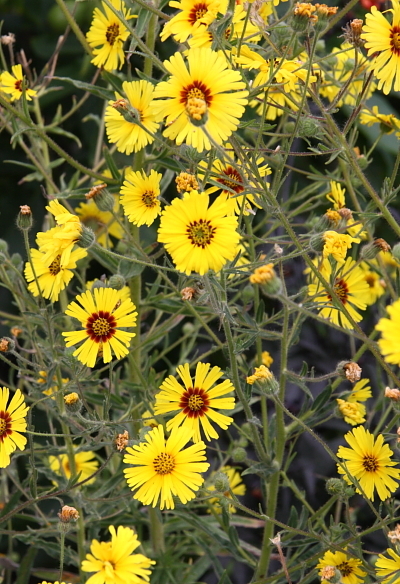 Madia elegans – photo Annual. Young rosettes are soft-hairy; by midsummer they can elongate from 3-7′ and short branches carrying many 1.5″ miniature sunflowers explode with color. Aromatic foliage. Madia elegans ssp. vernalis – photo Annual. 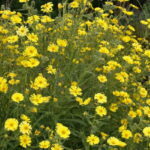 The cheery spring blooming form of common madia makes masses of 1-2″ bright yellow daisies on a rounded, well branched mound to 30″. 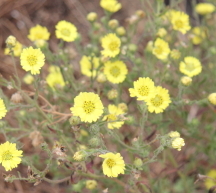 Leaves have the typical sweet tarweed aroma. 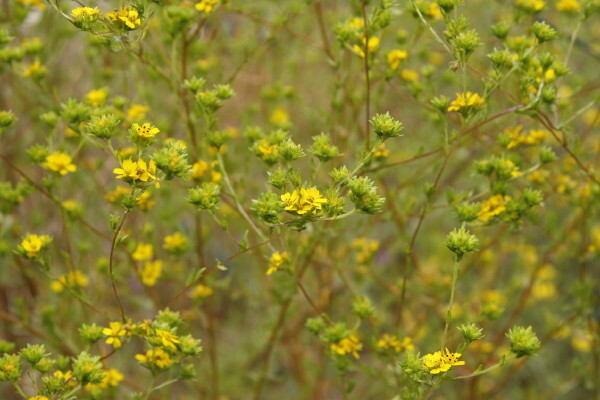 Madia gracilis – Annual. 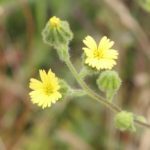 Grassy tarweed has slender stems, softly furry green leaves with a great aroma and many soft yellow daisy flowers to feed spring insects and butterflies. Adaptable and floriferous. Malacothrix floccifera – Petite annual makes clouds of 1.5-2 cm yellow to white flowers in late spring and early summer. Leaves have little white furry tufts when they are young. Can reach 12″ high by 18″ wide. Great for containers. 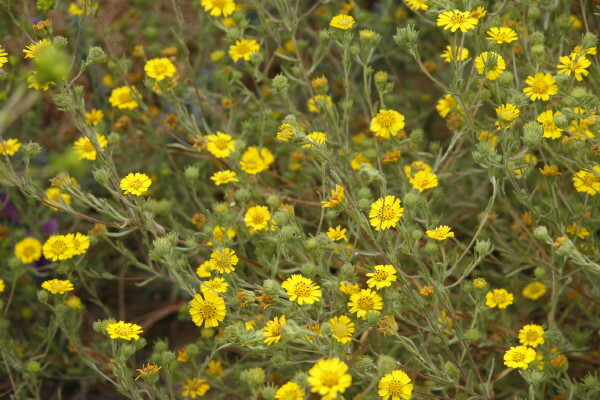 Mentzelia laevicaulis – Blazing star likes rocky or sandy slopes, washes and lean soil. 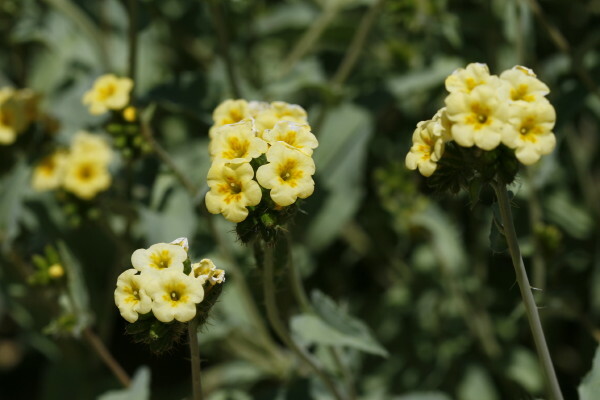 Stems to 5′ can show off their 4-5″ pale yellow flowers with a thick central burst of stamens. Late spring to summer bloom. Microseris douglasii [var. 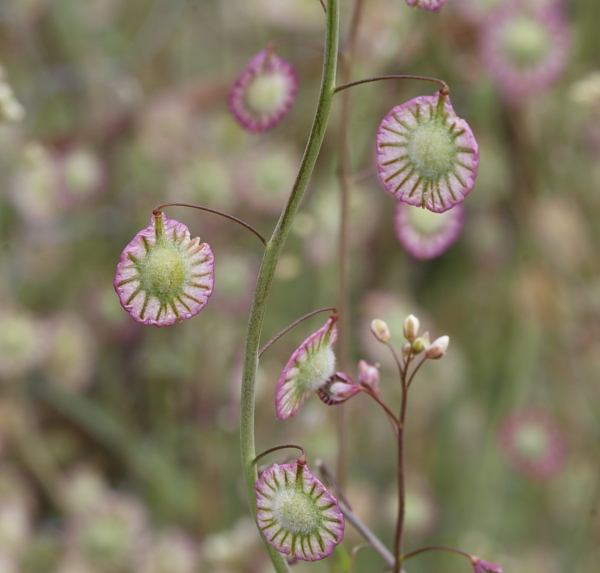 douglasii] – Douglas’ silver puffs are subtle when seen in their natural setting on grassy hillsides. But with a little tending they make charming leafy clumps with pendant white daisies in spring that develop striking silver puff-y seedheads. 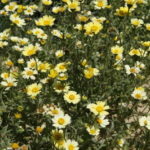 Monolopia stricta – photo Small yellow daisy flowers are held in frothy abundance over smooth gray leaves on this charming small stature spring blooming annual from the dry interior parts of California. 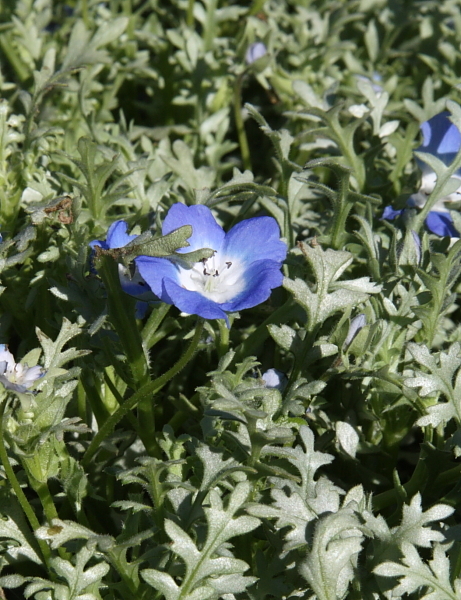 Nemophila menziesii ‘Frosty Blue’ – photo Typical baby blue eyes has those incredible baby blue flowers in spring set among green leaves with silver spots. This seed strain produces many plants with all silver leaves as well as the typical silver spotted ones. Annual, and shows up well in the shade. Oenothera elata ssp. hirsutissima – Biennial can reach over 6′ high in moist gardens. 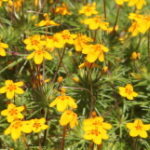 Vibrant yellow flowers to 3″ across climb up the stems as the summer progresses. Easy to grow. Birds love the seeds. 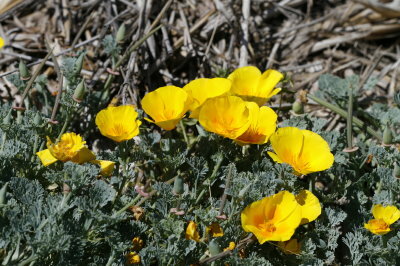 Papaver (Stylomecon) heterophylla – Wind poppy. Glorious 2″ orange flowers on thin stems can have maroon centers. Best with good drainage. Annual. Penstemon grinnellii – Perennial with broad gray-green leaves puts up spikes of fat pinkish lavender flowers in late spring and summer. Best with good drainage and occasional summer water. To 3′. 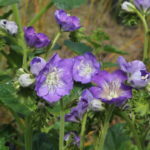 Phacelia bolanderi – photo Light lilac blue flowers are held on spreading stems over softly hairy, gray green leaves. Effect is subtle, but very pleasing. 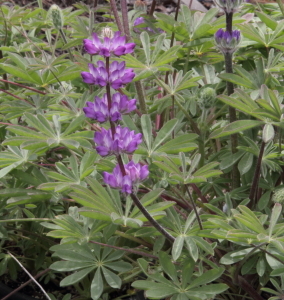 Good perennial plant for dry shade. 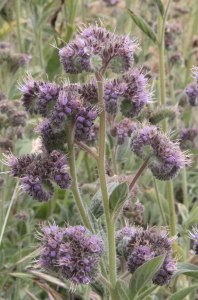 Phacelia ciliata – photo This bright lavender blue annual phacelia creates lakes of color in the Carrizo Plain area in spring during generous rainfall years. 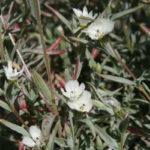 Flowers are held over lobed soft grey-green leaves. 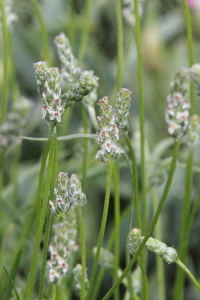 Plantago erecta — photo Found throughout California, foothill plantain can be quite abundant in spring. 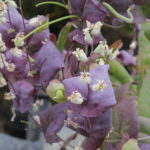 Leaves are narrow and short stems hold the translucent “bobblehead” flowers. Host species for checkerspot butterflies. 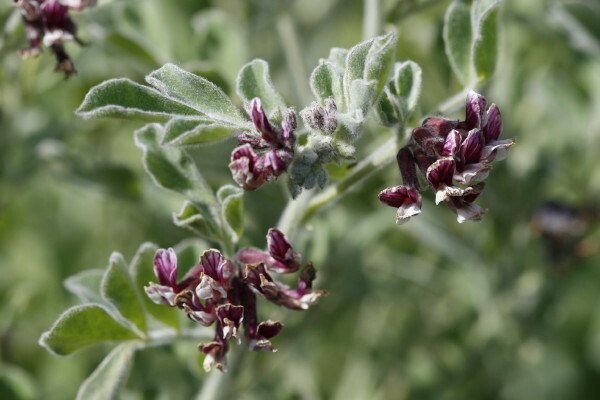 Pholistoma auritum – photo Clambering annual has widely lobed green leaves with silvery spotting, and large lavender blue flowers with white then dark centers. Showy annual for dry shade. Can be difficult to germinate. Romneya coulteri – White poppy flowers can be 6-12″ wide on this glorious perennial. 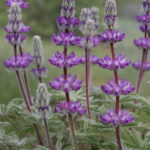 Not particularly easy from seed, it can be difficult to establish in the garden, and then difficult to eradicate if it settles in and begins relentless root wandering. But it is still very desirable. “Instant smoke” will be supplied to aid germination. Silene laciniata ssp. laciniata – Cardinal catchfly makes a real show in spring and summer when its display of bright red flowers can seem endless. Hummingbirds love it. 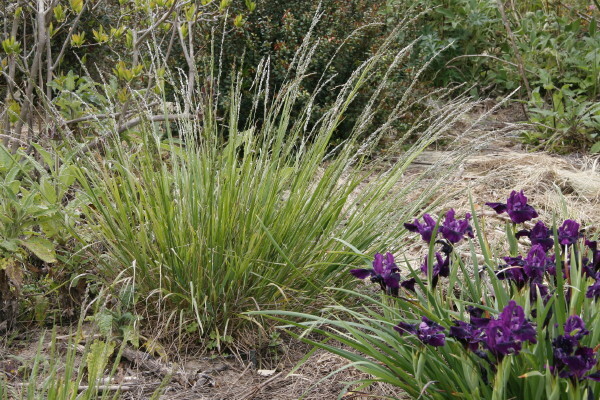 Perennial, erect stems to 2′. Stephanomeria virgata – Unassuming rosettes give rise to many thin stalks bearing bright light pink chicory-like flowers. Blooms for a long time with moderate water. Butterflies like it too. Annual, can reach 4-5′ in a good situation. Streptanthus farnsworthianus – photo Startling shiny red violet to navy blue bracts are up to 4″ long and 2″ wide on this spring annual. 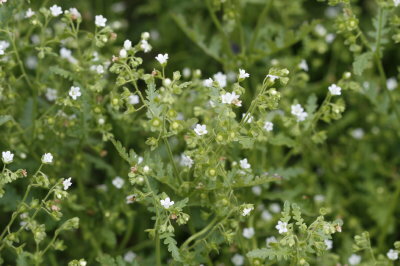 Actual small flowers are white. To 18″ tall. Easy to grow. Streptanthus glandulosus ssp glandulosus (albidus ssp. 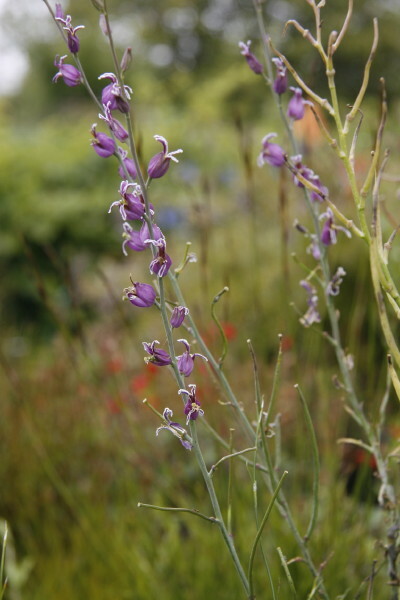 peramoenus) – photo An uncommon annual with bright mauve-purple inflated flowers on slender stems. Easy. Streptanthus glandulosus ssp. 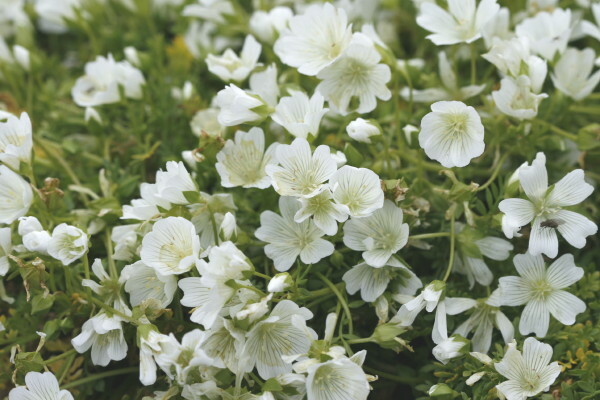 secundus – photo Little white pouch flowers set along thin stems are pretty in mass on this easy spring annual. To 12-18″. Streptanthus insignis – photo A slender spring annual that sends flowers up from a basal rosette. 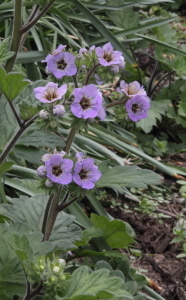 Showy sterile bracts held at the top are rich, dark purple; actual flowers are paler, but interesting. Most effective in a colony. 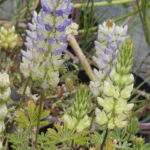 Trichostema lanatum – The outstanding woolly blue curls is not easy from seed. It needs super smoke plus (included) treatment and a long cold stratification. Long clusters of blue purple flowers from furry calyces and sweetly aromatic leaves are the reward for conscientious gardeners. Shrub. Trichostema lanceolatum – Vinegar weed is the pungent annual seen on roadsides and in (dry) grassy fields in late summer and fall. 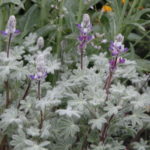 Pale blue flowers are thick on the sturdy upright stems to 12-18″. 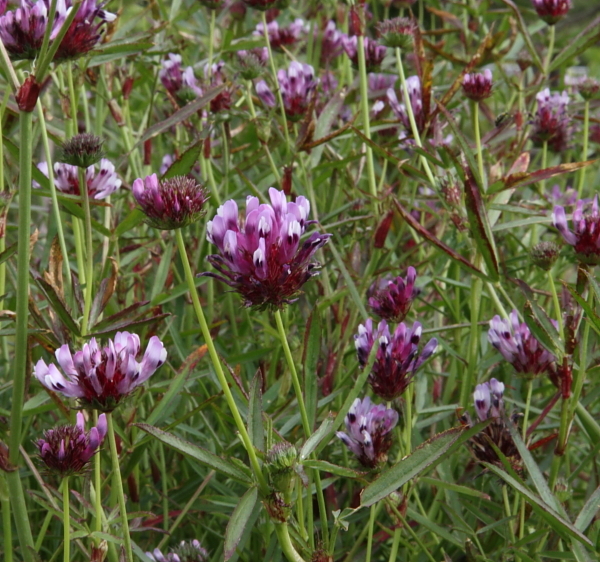 Trifolium fucatum – California, Oregon. 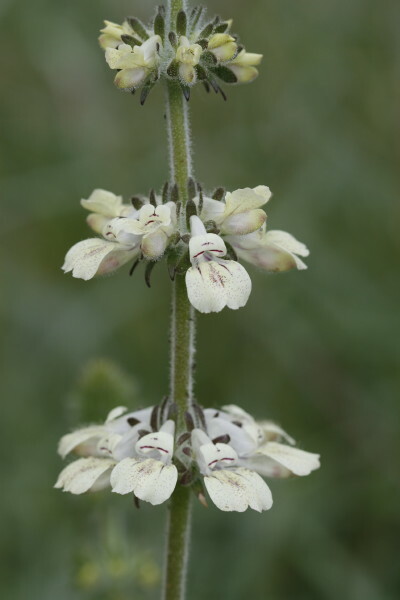 photo A very nice annual from wet meadows, lush green leaves often have interesting brown and silver markings. Large flower heads start out creamy white and age to a light rosy pink. Trifolium fucatum — in the broad sense. 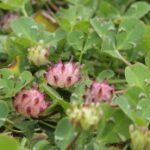 Affectionately called “cub clover” because it is a junior form or subspecies of T. fucatum this annual has lush green leaves with brown speckles and round greenish yellow flower heads that age rose. Grows on grassy slopes and in meadows. 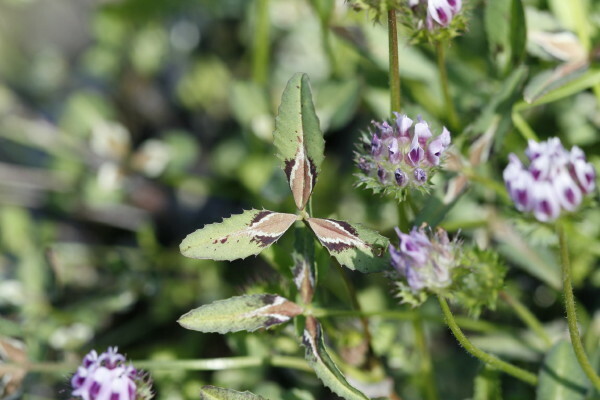 Trifolium gracilentum – The best feature of this clover is its gray-green low leaves with prominent red basal markings. 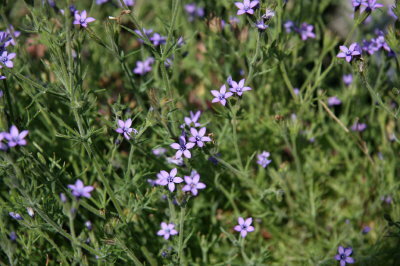 Small flower heads are a mauve-purple color. About 60 % of seedlings come true to leaf color. Trifolium grayi – This species has few markings on its rich green, lush leaves. 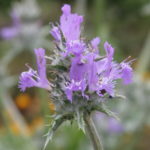 Heads of flowers are a dark lavender purple and are abundant in spring. 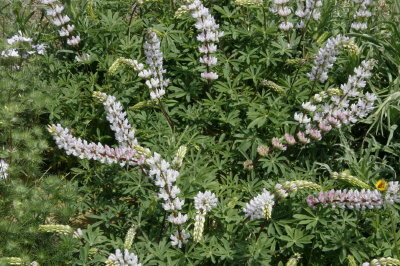 Trifolium lilacinum (T. barbigerum var. 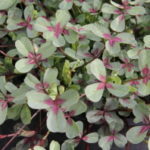 barbigerum) – photo Green, pink, cream and black are combined on (smallish) intricately patterned leaves. Flowers combine lilac and white. Trifolium phaeocephalum Greene – photo Flowers are darkest purple and white on this species; and can appear for a long time if season is mild. Some markings on the leaves. Classified in Jepson under T. variegatum. 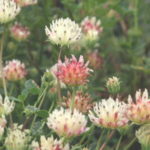 Trifolium willdenovii – W. United States. 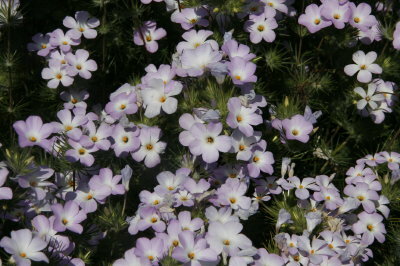 photo Thin leaves and many rich purple and white flowers on rounded heads. Some seedlings have burgundy leaves. Annual. Good on heavy soils.